There might be a cure. But the only way to get it is through Nissa Royal, a vampire with close ties to the masters of Las Vegas. Nissa is dangerous -- too dangerous to be allowed to live, much less work alongside. I was pretty disappointed in this book. But largely because I went in with really high hopes. I bought it because the heroine is a fat, butch lesbian and how often do they get to be the heroes in a story...an action hero no less? It wasn't the diversity aspect of the story that let me down though. Dana is just as the cover suggests (and YES she even got to be fat and butch on the cover!). She's married to a butch-ish woman. So, Reine didn't even play into the 'one of them has to be femme' trap. I love that. The police chief is a ball-busting trans woman, and it's engaged in the book, not just dropped in as a token. And not all the other characters are straight, white, cis, etc. So, I'm not disappointed to have bought a book that includes a lot of things I wish more books incorporated (Positively represented fat women on book covers? Hell yes, more!). Unfortunately, what let me down was that Dana is so darned unlikeable. She's rude and vile and dismissive of people who care for her. I don't mean that as any sort of 'proper women don't act that way.' Heck yes, give me more cursing, belching, sarcastic women. I mean it in the sense that she's almost cruel to a wife that loves her, prioritizing her own wishes over heartfelt pleas. She snarks off to people who are actively trying to help her, as if they are being unreasonable, etc. What's more, Dana is basically suicidal for a large part of this book, which means she runs head-long into battles with so little regard for her own life that it felt too much like a miracle that she continued to survive. Heroes/heroines that are so perfect in battle that they never even consider fear is are flat and uninteresting, IMO. All in all, Reine's writing is fine. 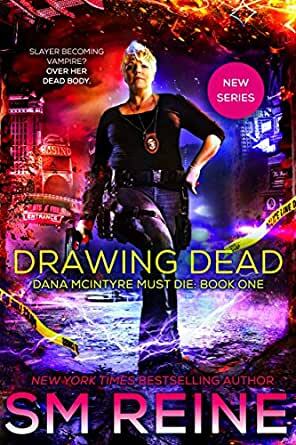 And despite there being 40 books in this universe (as of the publication of Drawing Dead, the book is readable as a standalone. But I wouldn't go so far as to claim you don't feel the lack of those other books. There were several decisions important in this book that are made based on the events of other books, and you notice. This book should have been right up my alley. Awesome cover, great blurb... but the action doesn't happen until 40% in. You don't even get to Dana's POV until like 30% in. I could barely force myself to complete it. I didn't care for Dana or all the swearing. I'm not offended by it or anything, I just feel it was used to show how "tough" everyone is, when instead it just made them seem juvenile. Maybe I would have enjoyed it more if I had read her other series first. Or if it had been a book from Nissa's POV. It's not good when secondary characters are far more interesting than the main character. Holy Vampire!! This was a non stop action packed story that kept me turning pages as fast as I could read. What a crazy bunch of characters, Dana, Anthony, Achlys, Shawn, Nissa and Mohinder just to name a few. The Las Vegas cops, Dana McIntyre, The Hunter Club are against vampires, shifters and even a Sidhe. The Vampires run Las Vegas and the Hunter Club wants to eradicate the vampires. So does Dana, every last vampire!! Of course the cops want to keep everything legal and peaceful, but the vampires do whatever they want which involves killing, torture, biting humans and changing them into more vamps! Dana, who is a human and has a love life that is suffering, runs into real danger that changes her life. Battles and fights galore bring us to a sad ending. Only the next book will show us how Dana will handle what lies ahead. A great start to this series. Yet another PoV on genesis. An interesting angle, more of the vamp side of things. I liked seeing more of Anthony I am interested to see how he has aged through the years since we first met him. I know I thought he used to be a freaking whiner/emo before becoming a copis and genesis. Brianna used to drive me nuts too with her personality. Dana is an interesting character; she reminds me a lot of her dad in ways. I find her relationship with Lincoln and the gods an interesting facet to everything. Her personality is a bit much though. At least for me I can gleefully say that I’ve not come across another character like her in my loads of reading so far. I don’t know if I like her or not yet. I didn’t like her much in the Magefire series, but as with most Reine characters how you feel about the character can flip-flop book to book or series to series. I love the diversity you get when you read one of her books. Reine’s imagination is astounding. 5.0 out of 5 starsYes!!! I am so in love with this series. Not only do we have a badass urban fantasy but the lead happens to be Butch and another character is trans and it is really well written and not cheesy. Thank you!!!! Seriously, anyone who likes urban fantasy with a kickass female lead and is ok with it not being heteronormative will love this series. Dana is wonderful. Her love of her wife shines through all even when they are arguing, which is most of the time. It makes the relationship seem more real. I'm live the fact that each book is action packed and this is not really a romantic theme, but still has the relationship in it. Make sure you read the books in order. The character development and storyline gets better each time.